There was palpable excitement among EMEC colleagues on Friday night when actor and environmentalist, Leonardo DiCaprio, shared the World Economic Forum’s video on Instagram showcasing the renewables revolution taking place here in Orkney. He has garnered well over one million views for this video over the weekend alone. The video itself was launched during DAVOS, the World Economic Forum’s annual conference which brings the world’s most influential leaders together to discuss global issues of importance; this year discussions centred around globalisation and associated global challenges in politics, climate and technology. From Japan’s Prime Minister Shinzo Abe to renowned broadcaster Sir David Attenborough, the forum brought together highly respected delegates from diverse areas of society to discuss the issues shaping the world we live in. Originally shared on the World Economic Forum’s LinkedIn channel, that video has been viewed over 240k times! Now a few quick corrections: Orkney generates over 120% of its annual electricity demand (not 140% as stated – although we’re progressing towards this), and the hydrogen is not powering schools (works are underway to heat one school using hydrogen and in terms of power, all of our schools are fed with the locally-produced renewable energy). That aside, we’re absolutely delighted that the World Economic Forum and highly influential environmentalists such as Leonardo DiCaprio are taking note of the pioneering advancements taking place here. 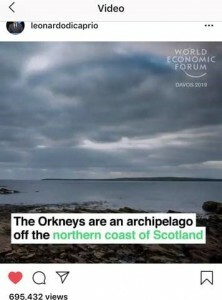 Another video, also shared by the World Economic Forum a few days earlier, cited Orkney as one of the global pioneers of hydrogen innovation through “game-changing” projects. Mentioned alongside powerful countries like Germany, Japan and England, the fact that Scotland tops the list with the innovation happening here in Orkney as the key example is an incredible achievement. In the last few years through project involvement, Orkney’s developing hydrogen economy has gained international traction. ‘Green’ zero-carbon hydrogen produced with surplus tidal and wind energy at EMEC’s tidal test site in Eday is being used locally to heat community buildings, fuel a small fleet of hydrogen powered council vans and as auxiliary power on ferries when docked at the harbour. Looking to the near future and our ambitions to decarbonise Orkney’s marine transport, progress is being made through the HyDIME project, gaining the necessary regulatory approvals to use hydrogen as a fuel on board vessels. If all goes to plan, we could see the world’s first fully hydrogen propelled ferry operating on Orkney’s interisland service within the next two years. And the World Economic Forum is not the only organisation taking an interest as over the last few months, EMEC have welcomed films crews from the BBC, the Financial Times, ITV News, Euronews and PBS NewsHour Weekend (US public broadcaster), all keen to find out more about the pioneering advancements in wave, tidal and green hydrogen taking place in Orkney. Living and working in Orkney, you sometimes need an outside perspective as a reminder about how special this place is. In terms of renewable energy and hydrogen, Orkney truly is at the centre of the renewable revolution with other countries looking to us for guidance. It just shows that all the hard work happening on Orkney doesn’t go unnoticed, and places like Orkney can influence global shifts in attitude.